Black Gold or Black Greed? The photos are disturbing. In the late 1960s, pesticide almost rendered the Brown Pelican extinct and just last year the unique bird, that at one time numbered 50,000 in Louisiana, was taken off the Endangered Species List. 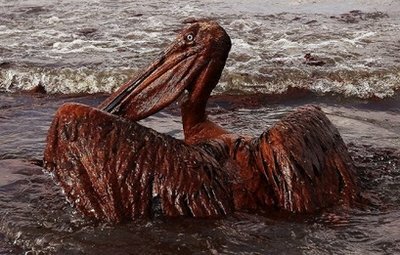 Unfortunately, the current crisis in the Gulf will most likely change the pelican’s status once again. The CEO of British Petroleum (BP), Tony Hayward, has admitted that “BP could have done more” to safeguard against the Deepwater Horizon oil rig explosion. Gee, Tony! Do ya think?!?!? Talk about a day late and a dollar short! You could have done more to prevent the worst environmental disaster in United States history? You could have done more to prevent the death of 11 men? You could have done more to prevent thousands and thousands of helpless animals from a needless death? Then why the hell didn’t you? The answer? In one word? Greed. …There are days when we exploit nature as if it were a horn of plenty that can never be exhausted. Greed. The more oil BP (and any number of oil companies) pumps from the depths of the ocean the more money that can be made and the larger the paycheck for executives of the company. The more corners cut the faster the oil can reach the surface and the more money that can be made for the oil company. The less thought about regulations that are in place to safeguard the lives of the people on the rig and protect the environment the more money that can be made for the owners of the rig. The result from cutting corners and ignoring regulations? Look at the Brown Pelican. Ask the widows of the 11 killed. Funny thing about nature; push her too hard and she finally breaks. What’s ironic is we work so hard to extract the oil she produces and now that she’s given it up we’re working so hard to stop it. We should all pray that the executives at BP figure out a way to do that before it’s too late. Unfortunately, judging from the looks of the Brown Pelican, I think it already is. Protest oil companies’ greed: stop driving. That is the biggest problem there is here. We need our cars to go to work, to get food and supplies. The bottom line is how can we begin the process of changing our lifestyle. We must begin as soon as possible. I agree with every word. I just want to add that the survivors need our prayers too. In Israel we would say Tehillim. I saw them on Anderson Cooper and my heart went out to them. I know they have a long road ahead of them. I just hope they know that we are glad that they are still with us and we are sorry for the loss of their friends/ colleagues. interesting post, sara. and quite sad, indeed. i love the connection that you made with the words from prayer– poignant and powerful! On a personal note, for some reason, I have some unnamed affinity toward pelicans. I love driving along PCH watching them fly above the ocean. They are striking. They are beautiful in flight and so funny looking with those big beaks. They make me laugh. In fact, I call them Jimmy Durantes for their ‘schnozes’! It is so hard to see all that animal life suffering. That’s the worst part of this greed thing for me, that and the human life ended at the explosion. I know what you mean, Lael. I think greed always has a human (and in this case animal) element. Something or someone always gets hurt. And how sad is it that no money has gone into any kind of research to safeguard against the exact thing that’s happening now? I heard Anderson Cooper say that there WERE some studies done regarding the impact of an oil spill of this magnitude… however, BP researchers said that something like this was “very unlikely, if even possible” to happen. Someone mis-calculated, big time! !